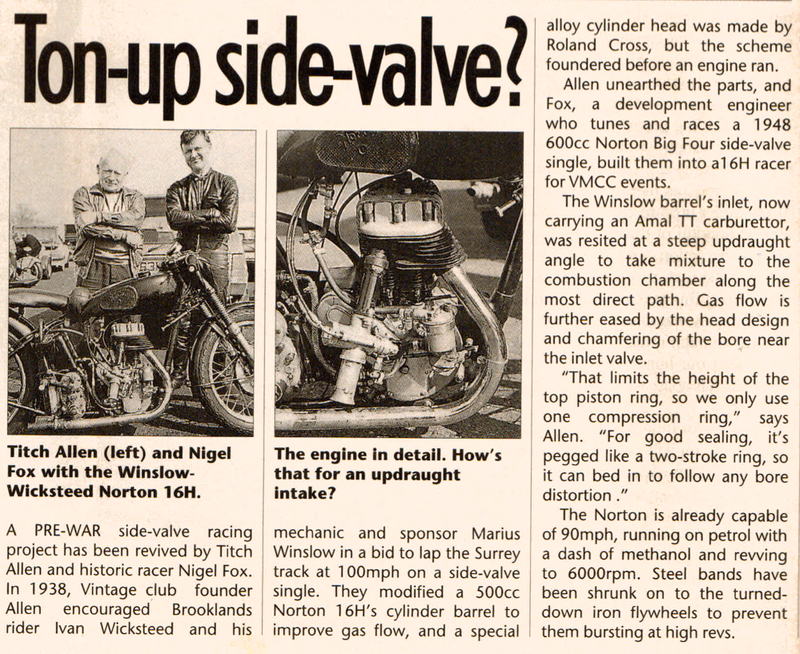 I run a unique Model 16H Norton racer; it’s based on a very special side valve barrel provided by VMCC founder Titch Allen who got it from Ivan Wicksteed; a summary is in the cutting below. The machine has reached a top speed of 121 miles per hour which is faster that the speeds obtained by famous tuners of side valve engines in the 1920s. Basis a pre-war rocker follower type engine. 82x100 (528cc). Special Wicksteed modified upswept inlet port barrel. (Titch seemed to think this work was carried out by Granville Grenfell at Brooklands). Special alloy head with modified chamber shape (Titch seemed to think this was made by Roland Cross). Inlet length 13” overall. Exhaust valve std 1.61” G2 (Austenitic). Inlet valve 1.75” (magnetic) modified diesel lorry valve. 2mm head clearance over Inlet valve at full lift. 6.5mm head clearance over Exhaust valve at full lift. Std cast iron valve guides. Valve clearances Inlet 0.004”, Exhaust 0.012”. Moto Guzzi LeMans valve springs (inner and outer). Both valves 103lbf load seated , 157lbf load at 0.375”lift. Insulating washer under exhaust. CR 6.67:1 , 50% squish over piston - 1.7mm clearance. Norton domed solid skirt piston, skirt shortened, (not 16H!). No top ring - slot filled with alloy ring and peened over, 2nd ring pegged two stroke fashion , standard oil ring. Std 8” En24 conrod , polished and shot peened, std big end. Flywheels turned down and ½” steel ring shrunk on. 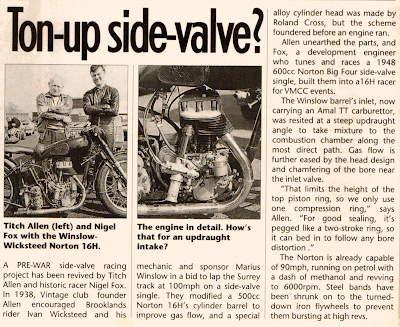 Flat bottomed tappets (Titch seemed to think these may have been an option for the OHV engine). Special Cams Inlet and Exhaust modified by myself for more and gentler lift from std Exhaust cams. Timings at 0.030” lift. Exhaust opens 71deg closes 45deg (total lift 0.334”lift). Inlet opens 57deg closes 60deg (total lift 0.375”lift) (These cam timings are very close to the KTT Mark VI cams). 40” total exhaust length - plain pipe. 1-1/16th Amal TT carburetter bored out to 31.5mm, rubber mounted. 0.118” needle jet, 2.5mm dia, main jet (820). Modified needle (more taper at tip to suit a large jet). Float level adjusted to give a drip at carburettor. Fuel 100% methanol + dash R40. R40 engine oil. Ignition timing 40deg adv., NGK B8EV spark plug. Gearing 21,42,24,43 teeth. 5,500rpm giving 114.1mph in top and 103.7mph in 3rd. Gearbox ratios 1,1.1,1.61,2.33 (a mix of gears from International and trials (?) available). Bantam forks and wheel (19” ) Tyre pressure 30,34 psi. 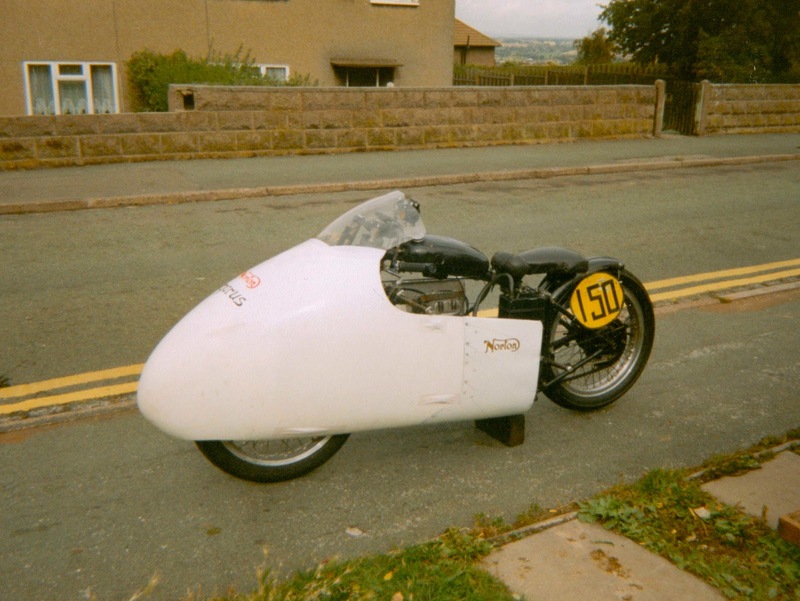 Fairing modified Sprint Super Nero replica (supplied by Titch). 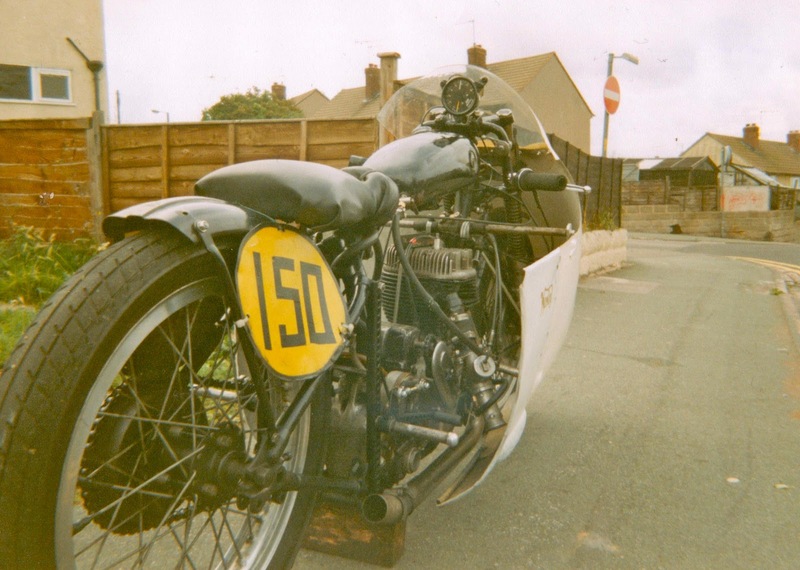 Comment on Run 3: Titch commissioned a friend to do some calculations on Run 3, and as the bike entered the timing lights at 112mph the calculations indicated the machine must have reached at least 121mph to have averaged 116.73 mph over the quarter mile. No fairing Gearbox ratios 1,1.21,1.614,2.33, Sprockets 21,42,19,43, 1200jet, on 25% nitro, ignition on 45 deg adv., Inlet 13“ overall, Exhaust 46” overall, no megaphone. 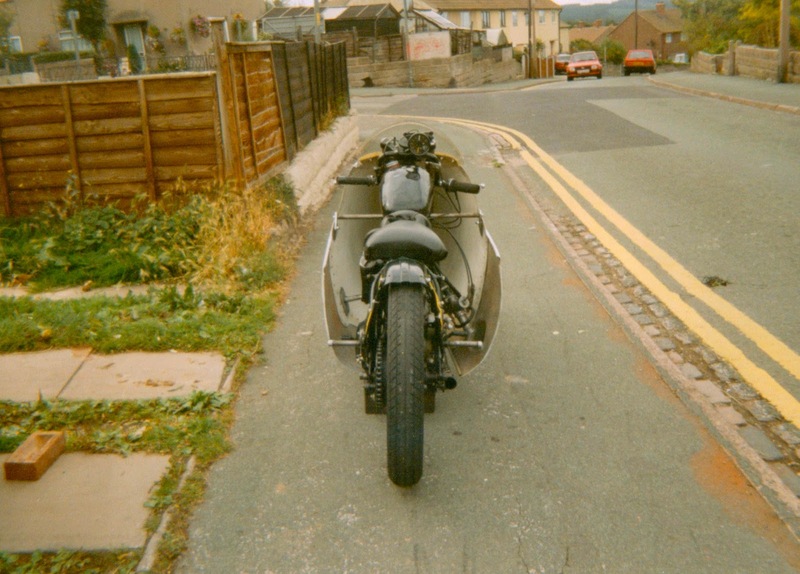 I worked at Norton (Shenstone) in the 1980s as a draughtsman and later a designer under David Garside and Doug Hele. Doug told me he designed and drew up the laydown Norton gearbox mechanism (I did not know this at the time - a very nice piece of work!). 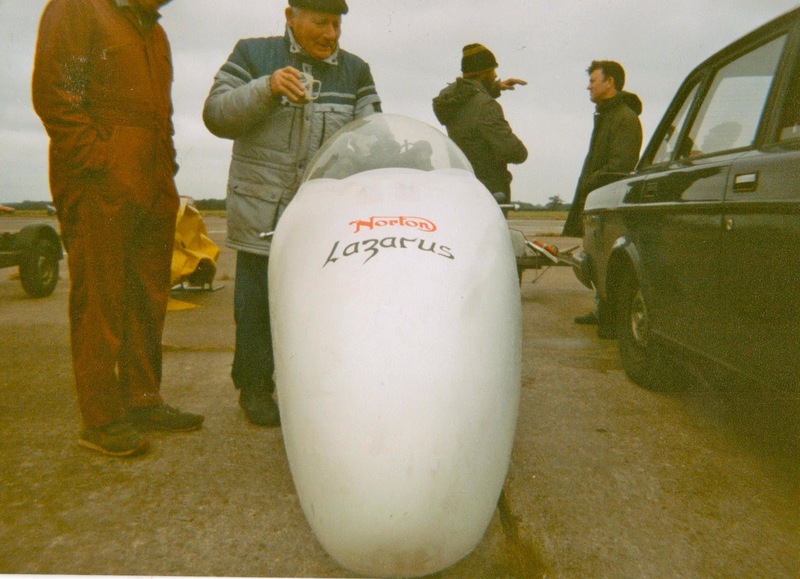 Doug just post war was working on the best flywheel balance factor for the Big4 and a young tester got killed on the test bike somehow and Doug received threats from the poor chaps family - to his life! While there in the 1980s Doug was doing tests with angled (back cut) face dogs on the Norton Wankel gearbox gears to aid selection, a young chap on the test bike crashed mysteriously on a road into Walsall, poor Doug perhaps haunted by the earlier events with the Big4 abandoned the angled dogs project there and then. This is only my interpretation - but he did relate the Big4 incident to me at the time of the crash. Doug also in conversation about past times also mentioned the Desmo Manx work but he did not seem that enamoured or over excited with the project, Cross rotary valve head - oil everywhere, and also a curious twin carb Manx engine sent over from Australia with much promise, that on test developed no more power than a standard Manx, I said maybe the carburettors were meant to be opened progressively to improve power spread, he gave me the same look; well similar to when I questioned the relatively small size of the carbs fitted to the Manx compared to the G50, Gold Star and racing Italian engines; I was relatively a young man and he was a real gentleman; I only ever heard him raise his voice once! 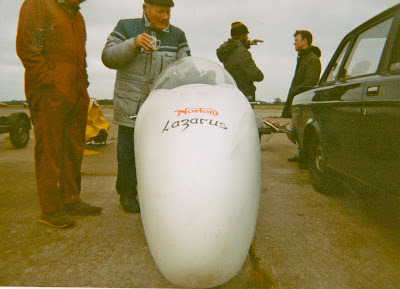 Doug also recalled to me that when in the 1950s working under Joe Craig he was given a design job for a new wheel spindle, Joe supplied a Velocette sample for Doug to copy, Doug went away and did his calculations and drew up what he thought was a better spindle design and showed it to Joe, his reaction was very abrupt “No just make it like the Velocette !”. Maybe poor Joe too was haunted by the past for Jimmy Guthrie riding was killed while riding a works Norton in 1937; there were also rumours of his crash being caused by the rear wheel spindle breaking.